Walking into a room full of college students coloring with the same supplies used by kindergarteners may be an unusual sight, but for Emerson freshmen Rachel Butler and Lucy Gatanis, it’s a success. Gatanis, a visual and media arts major, teamed up with Butler, her suitemate, to create a club dedicated to drawing and crafts. She said the Art Club’s goal is to foster an environment that is open for students to create artwork and meet new people in a no-stress atmosphere. Each meeting will focus on a different project, but Gatanis said they will never be too complicated. Around 15 students attended their first meeting in a Piano Row conference room on Tuesday, Feb. 17, with a project to sketch a still life. After attending the annual organization fair in September, Gatanis said she realized she couldn’t find any groups at Emerson that are just about having fun. She wanted something that is not career-driven and that does not involve a screening process. In forming the Art Club, Gatanis said she was inspired by her nostalgia for the simpler times of her childhood. This nostalgia goes back to the days when they created art while making friends, Butler said. She said it is important to create a community for creating art where people can feel free from criticism. Studies have shown coloring and other art reduces stress for not only children, but also adults. The relaxation is in part because of childhood memories, but also because art uses both logic and reasoning. 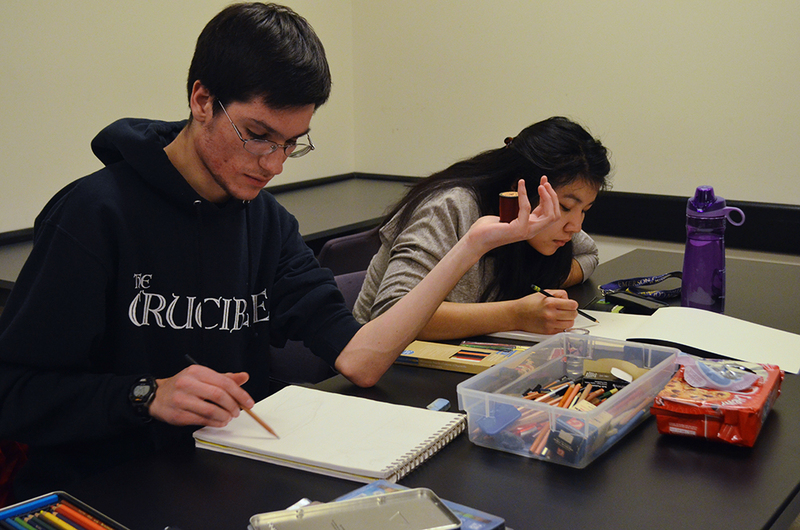 Freshman Ben Franchi, who joined the club, said art is his primary form of relaxation. Participants discussed the challenges of producing creative work for fun within their busy college schedules. “We are an art school and we didn’t have an art club, which is weird,” said Katelyn Guerin, a marketing communication major. “I know a lot of people who do art at Emerson, but there’s never been a concentrated place where we can all meet and socialize. Franchi said he thinks society sees art like an imaginary friend—nice to have when you’re young, but eventually, it becomes a waste of time. Guerin said this attitude has come about because public high schools are devoting fewer resources to the arts. She said she wasn’t able to take any art classes in high school until her senior year. At the club’s first event, the project was to sketch with pencil whatever still-life came to each artist’s mind. Some were drawing crude stick figures, while others had detailed masterpieces. After the event, which lasted an hour and a half, students were allowed to keep their sketches. Gatanis and Butler brought their own supplies, such as colored pencils, erasers, and markers to share on Tuesday, but said in the future, they plan to hold fundraisers, like bake sales, to finance bigger projects. They said their fear is having future events where there aren’t enough supplies or space for all the participants, particularly because anyone can enter the club. The co-founders said they do not plan on seeking recognition from the Student Government Association, because they would rather focus on being relaxed and simply having fun.